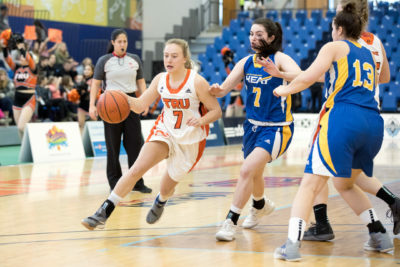 It has been a tough old season for the TRU women’s basketball team but these past two weeks the team has taken steps in the right direction, first they beat UBC and now they have swept the UBCO heat. Despite being the more dominant team, TRU was pushed to overtime as they beat the UBCO Heat 69-65 on Nov .23, on the Warner Rentals Court. TRU led 19-10 at the end of the first quarter and then led 29-23 at the halftime break. The atmosphere was lively and spirited as most of the School District 73’s elementary school students were in attendance for the game. Every time the ’Pack scored, the crowd came unglued and when the Heat scored, drop-dead silence filled the air. It felt like a real contest and it helped to create an environment that is rarely seen at TRU games. UBCO, clearly motivated by being behind on the scoreboard, came out strong in the third quarter and outscored TRU 15-10 and then 18-17 in the fourth quarter. The game was tied at 56-all at the end of regulation time. Early in the extra period, UBCO scored early and built some momentum which forced TRU to call a timeout. TRU regrouped and came back to outscore the Heat 13-9 to win the game. Michelle Bos was immense in overtime and scored two key baskets that helped secure the result. She ended the game with 21 points and six rebounds. Leilani Carney also had a strong performance with 18 points, eight rebounds, one assist and two blocks and Kanesha Reeves had 11 points, seven defensive rebounds and three assists. “It was a great game,” said assistant head coach Chuck Ferguson, commending the support that his ladies received from all those in attendance and acknowledging it helped motivate the team to perform better. “The support had a huge impact, nice to have a big crowd base like that, they were certainly vocal and very active, definitely they were the sixth man on the floor,” he said. Ferguson also acknowledged that in the extra period his team had to adjust to get the win. “We made some adjustments and changed some of our matchups and tried to force them into some outside looks,” he said. He explained that the game plan on offence was just to get the ball to the senior players which TRU managed to do and fortunately for them they came up big. Despite the previous game going to overtime, TRU trounced the Heat 87-61 on Nov. 24, on the Warner Rentals Court. The first quarter was very tight with TRU only having a two-point lead, the score was 17-15. Emily Vilac scored five points in the second quarter which helped TRU get a 39-25 lead going into the break. The key quarter in the game was the third as TRU completely dismantled the Heat by scoring 30 points. The Heat outscored TRU in the fourth but by that point all baskets scored were just consolation for a side that remains winless at 0-10 and was thoroughly outplayed. Michelle Bos had a big game and managed to get a double of 19 points and 10 rebounds. Leilani Carney was good once again with 14 points, four defensive rebounds and four assists. Ferguson had nothing but positive things to say about his team and their recent turnaround, there are some key areas that he believes have made a difference. Ferguson was very effusive about Michelle Bos as well. The ’Pack are now 3-5 and will be looking to keep the good times rolling as they take on Alberta before the Christmas break, one can only hope that the pack get an early Christmas gift of going into the break with a big upset win over Alberta.